If the titles for some of my postings are any indication then it would be a safe bet to say that the home office is a reflection of the inner workings of my mind. That is a rather disturbing thought, to say the very least. Today’s post provides an excellent example as well as case study. At first glance into the office there is an appearance of complete and utter chaos, especially in the latter stages of a project such as with the current book for History Press that will document the turbulent and often violent evolution of the American taxi industry over the course of the last century. I assure you, however, that there is method to the madness. There is a pile for everything and everything must be in the proper pile. If, however, the subject matter in one pile can be used to cross reference the materials in another pile, then they can then be organized in a manner that allows them to serve as the foundation for larger piles. Keeping the piles corralled are towering book cases filled with books, magazines, and more piles, as well as file cabinets where piles from previous projects are stored, and boxes with piles discarded from the current project that may be of use in future projects. Initially when research for the current book commenced, three basic piles began to form in a manner that provided an illusion of order in the chaos through the use of pretty colored tabs. In one pile was the research from the previous book written about the Checker Cab Manufacturing Company. The next pile consisted of the materials pertaining to malfeasance and mayhem, in the streets as well as in the boardroom. The last pile consisted of materials associated with bringing order and structure to the taxi industry, and stemming the violence associated with that business. Now, however, with mere weeks to go before deadline the piles are intermingled on a foundation of piles. As they reach heights that seem to defy gravity, I on occasion will allow the imagination to ponder if they are breeding and multiplying. The notes in the pile from previous work on documenting the history of Checker are in folders with notes on Pennant taxis built by Barley of Kalamazoo which is in the pile with notes on the violent taxi wars in Chicago during the 1920’s. This pile is now entangled with the one that contains notes and files on the New York medallion system, which in turn seems to be intertwined with the files documenting the SEC hearings and indictment of Morris Markin, founder of Checker, and E.L. Cord, and the dominance of electric taxis on the streets of New York City in 1900. What really makes this interesting is that more often than not I have an unrelated project vying for my time. This project is no exception and so the materials needed for completion of an article about the new Route 66 electric vehicle museum for Old Cars Weekly teeters precariously on the top of a book case because until I finish the current book, and make a valiant attempt to organize the piles, there is no where else to put that file. 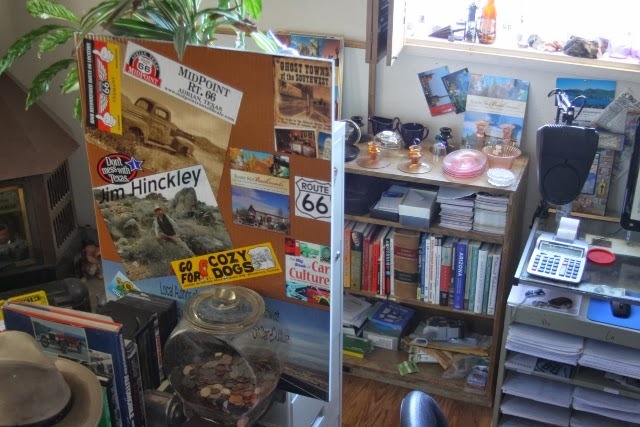 As Route 66 is the primary topic of ongoing interest, scattered about are the files in piles that are needed to answer questions, complete interviews, complete press releases for pending appearances or speaking engagements, to fill book orders, and to provide assistance to individuals and tour groups planing Route 66 trips. As we are closing in on Christmas as well as the end of the year, we can add two more items to the chaotic maelstrom; grandchildren and preparation for taxes. The latter is inevitable and with the former, attempts will be made to keep them at bay. I am more worried about them becoming lost among the piles than having them mix the piles up. In recent weeks I discovered another way to add to the chaos, immersion into the never ending learning curve. This time it is in the form of planning for the trip to the Netherlands, our first international endeavor requiring an airplane, and the research for a forthcoming series of articles about the trip and our preparation. And so I have a new pile started – international travel. The most recent lesson entails seating. Did you know that just because you share the same last name, and the reservations for tickets were made at the same time, and that the reservation numbers are in numerical sequence, this doesn’t ensure you will be seated next to each other. Interesting. Well, that issue was resolved – for an additional fee after forty minutes on the phone, twenty of which was spent un attempt to talk with a human. Interesting. At least I learned something new. I also discovered this intriguing website – seat guru. The new luggage arrived yesterday. Now I can commence a study in packing for a trip with but one carry on bag per person, and evaluate the practicality as well as durability of an Ebag and one from High Sierra. That file, the seed for a new pile should fit nicely under the scanner. One of the most awe inspiring aspects of the office is that within five minutes, I can locate almost anything needed. Now, where did I put breakfast?